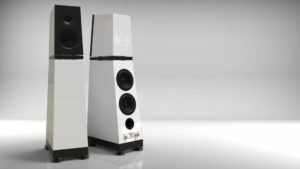 To further elevate their musical performance, Verity Audio has recently announced the addition of their proprietary floor isolation system to their new Otello loudspeaker. 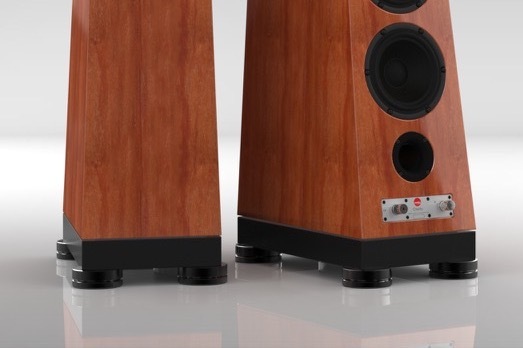 The floor isolation system had until now only been available as a feature of the significantly more expensive Parsifal Anniversary and Verity Audio loudspeakers above into their top of the line eXR speakers (all of which are upgradeable if you don’t have the floor isolation system). While the Otello was originally intended as an update of the popular and affordable Leonore, Bruno and Julien had not anticipated being able to add their highly effective floor isolation system to Otello given its price region. However, the gains the Otello project yielded significantly improved lower bass reproduction and overall musicality; this got the guys thinking, “What if?” A few listening tests later and voila! It was decided the addition of an Otello-specific version of their floor isolation system would be necessary. What’s the floor isolation system about? It is an isolation system that controls mechanical and acoustical floor interference. The system is inserted between the lower cabinet and the floor, measures 3-3/4 inch thick and has the same shape of the bottom cabinet surface. Underneath the isolation system there are 4 height-adjustable discs for proper leveling and additional isolation. Inside the platform lies the secret of this system where a well studied high-tech material arrangement is acting as an effective filter. What’s the “secret of this system”? We can’t tell you and they won’t tell us! Suffice it to say it works musical magic like all of the Verity Audio products!